With the enormous Takata airbag recall still not fully resolved, you may be concerned about the airbags in your own car. We don’t blame you! The attorneys at Taylor King know how unsettling it is to learn that something that’s designed to protect you could instead cause of harm. In spite of the bad rap they sometimes receive, you are safer with airbags than without them. The NHTSA estimates that airbags reduce the risk of death in front crashes by about 30%. We’ve done our research to answer your questions about how airbags work and how you can protect your family from airbag injuries. 1. How do airbags work to keep me safe? Airbags work together with seatbelts to keep you safe. Seatbelts function to keep your body semi-stationary inside the car during a wreck. The laws of motion come into play during a car crash: when your car comes to an abrupt stop, your body continues moving forward. While seatbelts keep you from flying through the windshield, airbags cushion your body from violent motion and prevent you from slamming into the steering wheel or dashboard. Some studies show that while seatbelts will protect you in side-collisions, airbags in the steering wheel area only help when it’s a head-on crash. It’s true that seatbelts are the #1 best form of accident protection. But technology has advanced rapidly. Newer model cars often have multiple airbags, including some in the side door or seat. This means you’ll be protected from all sides. And all new cars sold in the United States since 1998 have been required to have driver- and passenger-side airbags. 2. What causes the airbag to inflate? Your car is equipped with a sensor that detects impact. Airbags will not inflate if you simply slam on your brakes; there has to be an impact (like hitting another car, or a pole). If the impact is small or at a low speed, your airbags will not deploy. But if the force of the impact is equal or greater than that of running into a brick wall at 10-15 mph, the sensor signals the inflation system. The inflation system is designed to inflate the airbag quickly, at speeds up to 200 mph, and then to deflate quickly so that your vision and movements are not limited. And all of this happens in about 1/25 of a second. 3. 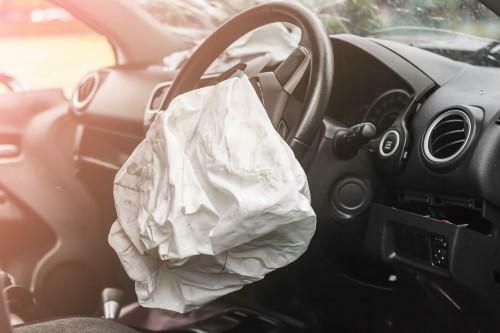 Why do airbags sometimes cause injuries, and how can I avoid that? You already know that serious injury or death may be caused by defective airbags. But in other cases, people have been injured by properly functioning airbags. Sometimes the problem isn’t the airbag, but the passenger. There’s a common factor among people who are injured or killed by airbags, and it’s not their height, weight, or gender. It’s how close they were to airbag when it deployed. An airbag must inflate quickly and forcefully to protect you, and the force is greatest in the first 2-3 inches after it inflates – called the “risk zone.” If you are 2-3 inches away from the airbag when it deploys, it can hit with enough force to cause serious injury or even death. The very best way to ensure that airbags will protect you from injuries, not cause them, is to keep your distance. Experts says that sitting with your chest 10 inches away from the dashboard will minimize your risk of airbag injury. It’s also very important to keep children under the age of 12 in the back seat, because the force of the airbag may be too powerful for a child’s small body. Never let a younger child ride in the front passenger seat. Were you or someone you know injured by a defective airbag or other defective part in a car? You may have legal rights. Taylor King Law is ready to help. Call 1-800-CAR-WRECK (1-800-227-9732) to begin your FREE, no-obligation consultation. You’re one call away from getting help today. For more information on the Takata Corp airbag recall and a full list of the recalled vehicles, read our last post: Takata Corp Issues New Airbag Recalls.